Sometimes I just need more Lulu. Nothing like a chubby, smiley, perfect little baby niece to brighten one's day. Too bad she lives so far away. Them cheeks needs all the room they can get! I love it! what a smoochie little doll baby. 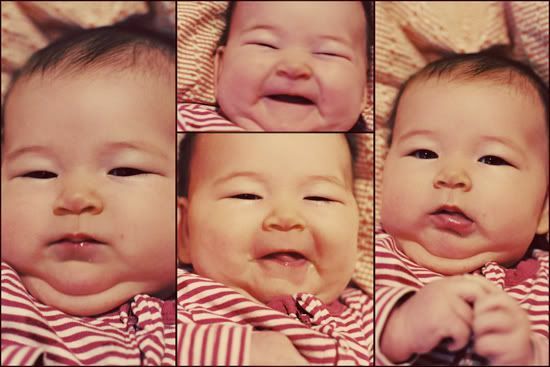 My husband would go nuts for this one...a chubby cheeked asian baby. He is a sucker for them. *deep sigh*. I miss her. I miss you too! We call our Lucy: lulu, boo, shmu, boocy. and every combined variation there is. And out Lucy isn't nearly this cute. I'll have to give Baby Girl a few extra smooches this morning! Too cute!! What a precious little girl. Glad you liked my "Queen"!!! LOL She was a real trip! There is another of her flirting with our friend on Facebook, I'll send it to you there! Nothing better than chubby baby smiles. Those cheeks just say, Kiss me! Oh. My. Goodness. those Chins!!!! She is such a cute-e-pie. Why did I buy a scale again?